Where is the line between imitation and flattery drawn? Nothing exists in a vacuum and in the world of board games that means that newer games are built upon the inventions and refinements of games past. It's perhaps unfair to ask every game to be unique and revolutionary, but the danger of being derivative always looms. This is a follow up article to a game covered earlier. As such, it assumes that you are familiar with the game and how it works. If this game is new to you, check out the Initial Thoughts video to see if it's a game you would be interested in. I generally try to talk about games here on the Bottom Shelf based on their own merits. Occasionally, I'll reference another game where I feel it's appropriate, but generally I try to keep my reviews self contained so you don't have to rely on knowledge of other games. Clans of Caledonia is different. Its similarities with Terra Mystica are readily apparent and the designer is upfront about the influence. Seeing as Terra Mystica is very popular and a highly regarded game, comparisons are bound to arise. In broad strokes, both games take place on hex maps with varying terrain types and you control factions that grant you unique advantages. You also have a player board that organizes your units and reveals your income as you deploy them. There are other similarities to be sure, but it's more interesting to talk about what sets Clans of Caledonia apart. The most prominent addition to the formula is the fulfillment of contracts. The actual act of fulfilling a contract, I find, is a bit anticlimactic. The rewards are generally too subdued to elicit any real excitement. A typical contract grants some import goods, perhaps a few victory points, and maybe a little cash. Don't get me wrong, the rewards are important to winning, but they're just not all that flashy. Import goods go towards winning points in a majorities race that is resolved at the end of the game. Again, it's really important in regards to winning, but in the moment it's hard to get pumped for them. Victory point rewards are obviously important but they aren't even added to your total until the end so you don't even get the satisfaction of seeing your little point marker move up the track. Cash rewards, while not the most imaginative reward, are at least something tangible. The most interesting rewards are the Free Space and Bonus Upgrades. Free Space rewards allows to immediately place a unit on the map without paying the terrain cost. The Bonus Upgrade grants you a free merchant, free shipping increase, or a substantial discount on upgrading the income from your workers. They are rewards the reap immediate rewards. They push you further in the direction you are headed, momentum boosters. They might not be better mathematically than straight up victory points, but they feel better. They play into my bias towards growth. I like seeing my territory growing. I like seeing my stats go up. Sometimes feeling stronger is better than moving towards victory. Though I may not be completely enthralled by all of the contract rewards, the journey to achieving them is quite enjoyable. Each round of Clans of Caledonia is a challenge. Every turn you are a confronted with a wealth of choice. Will you upgrade your shipping or grab a contract? Will you visit the market or build a dairy farm? Knowing what to do moment from moment can be a bit of a mystery. Inspired by Terra Mystica, Clans of Caledonia borrows the notion of individual round scoring. Every round has a different way to score points that's randomized for each game. They act as breadcrumbs out of the forest. I tend to play games from the gut with little thought to long term strategy (a trait that unfortunately seeps into my real life). Having these bite-sized goals gives me a more immediate goal to work towards and highlights the best part of the game: the unique clans. Perhaps the most egregious example of flattery comes in the form of the unique and distinct player factions. As in Terra Mystica, you are assigned (or earned through auction in an advanced player variant) a clan which will dictate your game plan in a very real way. By giving you an advantage that no other player has you are empowered and given some more direction. Clan Cunningham, for example, can turn milk into butter which nets a tidy profit. This will give you nice boost to your income as well as an idea of where your should be focusing your efforts (make lots of milk). Some of the clans are more interesting than others. Clan Fergusson starts with an extra worker on the map and an shipping level of 2. It's a nice benefit but pales in comparison Clan MacDonald which can deploy their workers in the water spaces as fisherman. I'm not saying one is stronger than the other, just that one feels more special. Being the only one able to set sail and troll for fish sets you apart in a way that getting a small head-start just can't do. Thankfully, most of the clans give you some sense of being special. It's a good feeling when you're bending the game in ways that are unique to you. It shines a spotlight on you every time you take advantage of your power. After being run through it's paces for years and over thousands of games, the Terra Mystica community established power rankings for the various player races. I'm sure that there's merit to the rankings and I'm sure I don't care. I've never been too concerned with balance in games as long it feels like I have a fighting chance and, more importantly, it feels as if my actions are consequential. 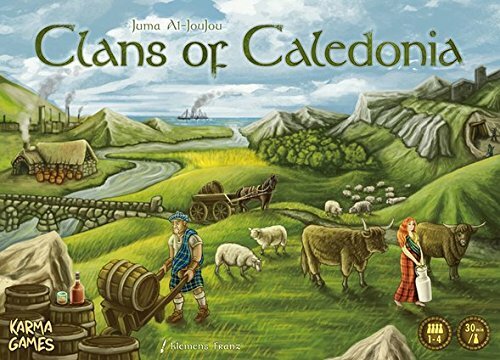 I'm sure, over time, the Clans of Caledonia community will establish their own rankings, but what I'm more concerned about is that the clan powers aren't as varied or, in my opinion, interesting as those in Terra Mystica. A large part of that has to with Terra Mystica being the more complicated game and having more dials to play with. They can manipulate more facets of the game by simple virtue of there being more facets of the game to begin with. The clans, while pleasant in their own right, can't live up to the heights of races established in Terra Mystica and is symptomatic of the game as a whole. Clans of Caledonia strips a lot of the complications that defines Terra Mystica as one of the more challenging games around. It reduces the amount of terrain types and ties it to a single currency and building upgrade paths are slight and linear. It wouldn't be unfair to label it as Terra Mystica Lite. But that's really not a bad thing. Taking a multi-hour experience and distilling into something that can be played in just over an hour is no easy feat, but Clans of Caledonia manages to pull it off successfully. I still get the satisfaction that comes from watching my faction creep across the map, jockeying for position, and cutting people off at the pass. I'm still faced with the decision of developing my economy early or pouncing on victory points when they're cheap. I still get to feel special and powerful as I use my clan's ability throughout the game. I still feel all this with less setup and less time investment. To claim that Clans of Caledonia is completely derivative is unfair. It does add it's own twist to the experience in the form of contracts, a fluctuating market, and points of interest on the map. They all serve to differentiate itself from its progenitor. The market stands out most of all. Prices fluctuate based on player action. See the price of wool creeping up? Perhaps it's time to invest in some sheep? Your opponent needs some cheese to fulfill a contract? Better buy some from the market and drive the price up before they get a chance. It's a nice diversion that plays into the notion of empowering the player. The prices increase or decrease because you make it happen. When you design a game that so closely resembles another, comparisons are bound to be made and when it comes right do it, I think Terra Mystica is the better game. But it's also a more serious game. Furrowed brows and twisted faces amidst a cloud of silence as Terra Mystica lies on the table is a common sight. Clans of Caledonia is decidedly more pleasant. Even a quick visual comparison of the two shows the difference in attitude. Terra Mystica is staid and subdued. Clans of Caledonia is bright and cheery. I can't help but have a smile on my face when I navigate my clan towards the final rounds. It's just so very pleasant. And while it may not reach the same heights as Terra Mystica, it does capture a lot of the right elements. And that's a pretty good thing.